Turtle Lake Public Library | Read. Connect. Explore. 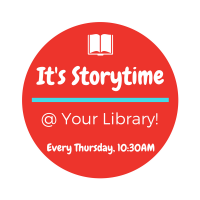 Join Allison every Thursday, 10:30 a.m. for our storytime! Did you know that storytime helps develop language and social skills in children? Want to know what’s happening at your library? Click on the button above to get to our calendar and more information about upcoming programs! Have a library card? Read eBooks, listen to eAudiobooks and more through the Libby app on your device or by visiting the Wisconsin Digital Library.